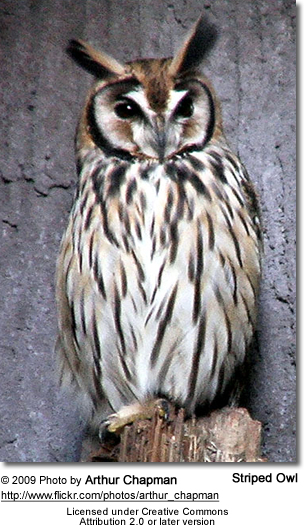 The Striped Owl (asio clamator) lives in South America, and parts of Central America. It uses a variety of habitats, including riparian woodlands, marshes, savannahs, grassy open areas, and tropical rainforests. It can be found from sea level to 1600 meters and above. Its systematic placement is not resolved. Different authorities place it either in Asio, in Pseudoscops together with the Jamaican Owl, or more rarely into the monotypic (= one single species) genus Rhinoptynx. 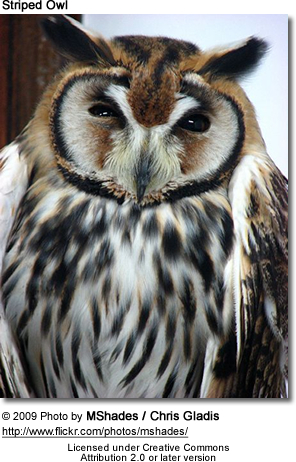 The striped owl is a medium-sized owl with large ear tufts and a brownish-white facial disk rimmed with black. Its beak is black, and it has cinnamon-colored eyes. It has shorter, rounder wings than most of its close relatives. The upperparts are cinnamon with fine black vermiculation and heavy stripes. The underparts are pale tawny with dusky streaks.